Stockton University’s national search for a crew coach ended in Atlantic City. John Bancheri, a 1978 Atlantic City High School graduate who is recognized as one of the country’s top college rowing coaches, will be taking over the Ospreys’ women’s varsity program and men’s club team. He spent the last 13 years coaching at Grand Valley State University in Michigan. In August, Stockton President Harvey Kesselman, his wife, Lynne, and Stockton athletics director Kevin McHugh formed an advisory committee that included some of the top coaches and former rowers from South Jersey, a hotbed of high school rowing. The group included legendary Holy Spirit High School and University of Pennsylvania coach Stan Bergman, St. Augustine Prep coach Ray D’Amico and Southern New Jersey Scholastic Rowing Association President Sue Peterson. Bancheri, 59, was picked to build Stockton’s women’s team into a NCAA Division III national power and develop the men’s club team into one that can compete for an American College Rowing Association (ACRA) title. Bancheri has been a successful coach for more than 35 years. 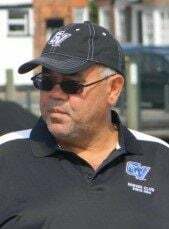 Since 2005, he served as the head coach of the men’s and women’s club teams at Grand Valley State, where he was a four-time ACRA women’s coach of the year (2009, 2012-14). High school rowers drew many of the biggest crowds of the high school sports year, with hundreds and sometimes thousands of fans lining the shores of Lake Lenape, the Cooper River and the Schuylkill River. The Oakcrest girls novice-four crew of, from left, coxswain Raven Macintosh, bow Jessica Guido, Abbey Thompson, Giana Fortson and stroke Megan Gaskill wins at the Atlantic County High School Rowing Championships on Sunday. Absegami’s girls lightweight 4+ boat defeated an Egg Harbor Township boat for gold Sunday at the Atlantic County High School Rowing Championships on Lake Lenape in Mays Landing. Shown are coxswain Camryn DeWolfe, Courtney Reed, Alexandra Contino, Emma Daniels and Francesca Palacio. Ocean City celebrates its first-place finish in the boys varsity-eight race Sunday on Lake Lenape in Mays Landing. The crew included coxswain Matthew Catanoso, Alexander Oves, Blase Japzon, Gregory O’Connell, Luke Hornick, Jack Branin, Seth Pierson, Noah Centrone and Jake Ruskey. Ocean City won the overall girls points trophy. St. Augustine Prep won the overall boys title. Under his guidance, Grand Valley was the ACRA overall team points national champions for six straight years (2008 to 2013) and was the women’s team points champions from 2008 to 2015. Grand Valley won the women’s Division I heavyweight eight at the Dad Vail Regatta in Philadelphia in 2009 and 2013 and was the women’s team points champion in 2013. Prior to coaching at Grand Valley, Bancheri spent 12 years (1994 to 2005) as the head coach at Marietta College in Ohio, where he rebuilt a struggling program into an NCAA Division III national power. He was the Dad Vail men’s coach of the year in 2002 after helping the team win the points title at that regatta. In addition, he served as men’s and women’s crew club coach at Wichita State University (1987 to 1994) and as women’s varsity coach at the University of Charleston in West Virginia (1984 to 1987). Stockton’s program will be based at the university’s new Atlantic City campus and will share Atlantic City High School’s boathouse. Within three years, Stockton wants to have at least 30 rowers for both the men’s and women’s programs. Given the number of successful local high school teams, that shouldn’t be too difficult. Several local girls teams finished last season ranked in The Press Elite 11: Holy Spirit (second), Ocean City (third), Mainland Regional (fourth), Vineland (sixth), Absegami (eighth), Egg Harbor Township (ninth), Atlantic City (10th) and Cedar Creek (11th). Our Lady of Mercy Academy and Vineland also have teams. The same goes for Stockton’s efforts to increase the numbers in its boys club program. Ocean City (first in the Elite 11), Mainland (second), St. Augustine (third), Absegami (fourth), Oakcrest (fifth), Holy Spirit (sixth), Atlantic City (seventh), Egg Harbor Township (ninth) and Vineland (11th) all had solid seasons last spring. Cedar Creek also has a team. Bancheri rowed for legendary coach Bob Garbutt at Atlantic City High in the mid-1970s.